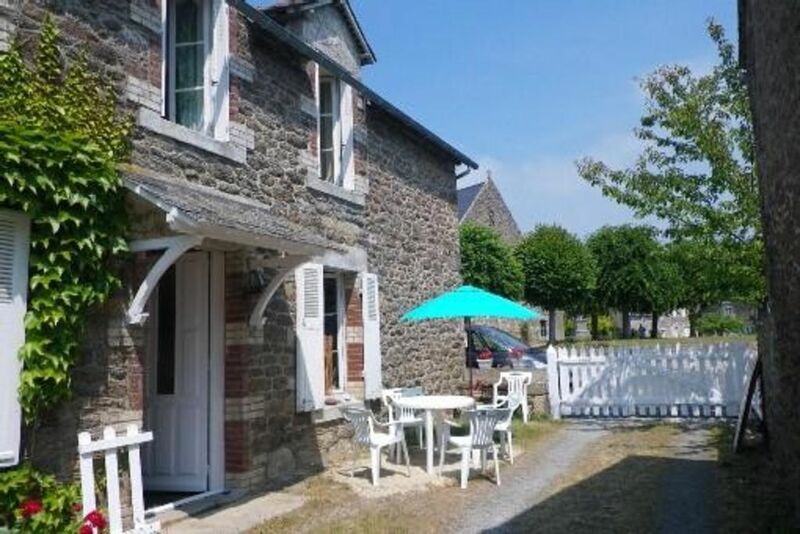 House late 19th century in the heart of Créhen, charming typical Breton village between sea (Manche) and Brittany countryside. A few kilometers from the beaches in Saint-Jacut-de-la-mer 10mn, 15mn Saint Cast, Notre Dame du Guildo (7mn) Lancieux (15mn), Dinard (25 minutes), Saint Malo (35 minutes) ... l spoiled for choice! All amenities on site, to Créhen: pharmacy, medical office, health office, post office, newsagent-Bar, Bakery, Town Hall. According to availability, babysitting service; terms to be defined on site or on reservation! Ground floor: hallway - 1 living room composed of a kitchenette, a dining area and a relaxation area (TV). 'Green' room: 1 bed 140, convertible into 2 beds 70cm + sink. Courtyard view. Clarity. "Blue" Room: 1 bed 80cm. 1 office, 1 chest of drawers, 1 bearing for locker room. Courtyard view. Clarity. Room "Red": 2 "pull-out" beds 80cm. 1 office. extended view. Beautiful light. Bedroom "Rose": 1 bed 80 cm. Bathroom sink. Small corner "office". Half floor: shower room. Small bath. WC. Bathroom sink. Washer / Iron. Parking: 1 or 2 on the church square, in front of the house. windsurfing enthusiasts, kite surfing, kayaking and catamaran will delight in the nautical club of Saint Cast or St. Jacut, offering internships and formulas taught by experienced professionals to practice safely. Many bike tours are also available on the entire coastline to enjoy the quiet and gentle green sea and countryside. While walking, you will discover the peninsula of Saint Jacut and the island of Hébiens. A few kilometers from Créhen, you can explore Brittany Middle âgeuse Dinan. You will stroll in the feast of the walls in the middle of fire eaters, troubadours, blacksmiths, Cordeliers ... and attend amazed equestrian jousting. Your steps will also lead you to the seaside town of Dinard access to English. You will indeed drink tea after enjoying a walk along the beach surrounded by beautiful and large houses. Then it will be time to try your luck at the Casino. Finally, it will be impossible to miss the beautiful ballad on the walls of Saint Malo. And you too succumb to the charm of Mont Saint Michel, "Wonder of the West ', which stands at the heart of an immense bay invaded by the highest tides in Europe at only 1h30 from Créhen. Good stay in the land of fantasy, adventure and dreams. Nous avons passé une quinzaine bien agréable dans cette charmante petite maison dans laquelle on se sent "comme à la maison" ! L'accueil était vraiment parfait ! De bien belles vacances !! Pour un premier séjour en Bretagne, nous avons été ravis. La maison est très agréable, proche de tous les lieux de la Côte d'Emeraude à visiter : Dinan, Dinard, Saint-Malo, Fort de La Latte, St Briac (à voir absolument). Malgré sa situation au centre du village, l'ambiance est calme et reposante. La déco intérieure et sympa. Nous reviendrons certainement pour un séjour "plus ensoleillée. Maison de ville très agréable à vivre : propre, bien équipée et joliment décorée, en plein coeur du vieux village (église, commerces à pied à 2mn) de Créhen et néanmoins au calme. De nombreuses plages à moins de 10mn ... mais pour le coup, il faut prendre la voiture (ou les vélos). En bref un séjour très agréable et aucune mauvaise surprise ! La bretagne comme on l'aime!! Idéal,pour des vacances en famille! Tout le monde y trouve son compte, les plus jeunes comme les adultes. La plage, le farniente, les ballades en vélo, la voile...On a vraiment aimé et c'est sûr on reviendra l'année prochaine!!! Que du bonheur!!! Many mountain bike trails are also available on the entire coast to enjoy the peace and quiet between sea and countryside. A few kilometers from Créhen, you can discover the Brittany Middle Ages of Dinan. You will stroll in the feast of the walls in the middle of fire eaters, troubadours, blacksmiths, Cordeliers ... and attend amazed equestrian jousting. Your steps will also lead you to the seaside town of Dinard access to English. You will drink a tea after enjoying a walk along the beach lined with beautiful and large homes. Then it will be time to try your luck at the Casino. And for everyday life, what's more intoxicating than stroll on the different markets all more alive than each other. Enjoy your stay in the land of fantasy, adventure and dreams. Nous offrons à nos vacanciers une remise de 10% sur la 2ème semaine.